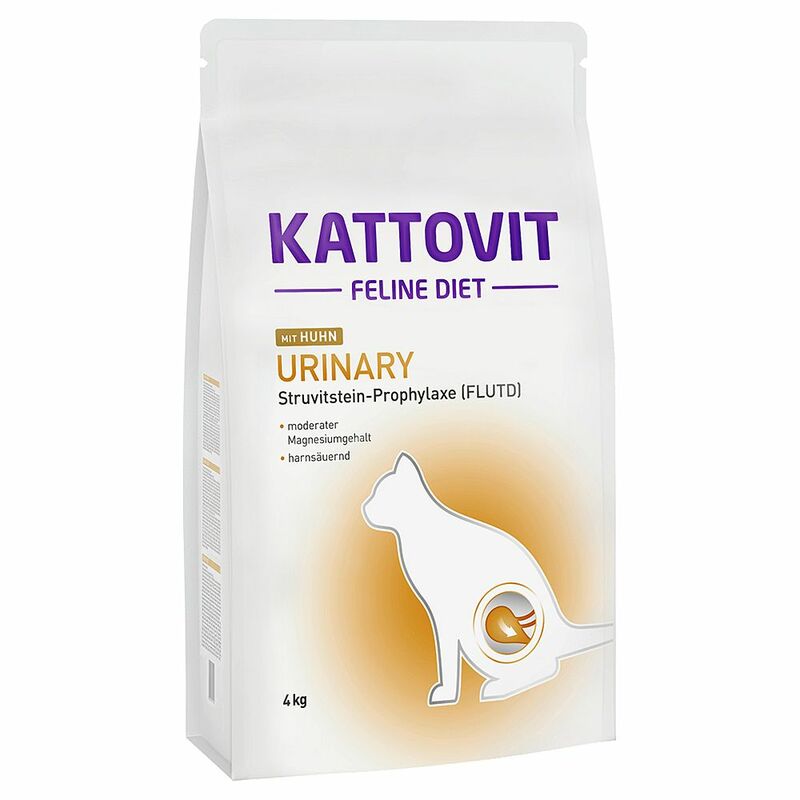 Kattovit Urinary wet and dry food for cats suffering from diseases of the lower urinary tract. FLUTD (feline lower urinary tract disease) is a common disease that is often aΒociated with the formation of extremely unpleasant struvite stones, which in turn can lead to secondary diseases of the kidney. These feeds therefore contain only a very low content of magnesium, which can help prevent such problems. Low magnesium content in food can reduce the amount of minerals in urine, which can prevent the formation of new kidney stones. The added DL-methionine increases the acidity of urine together with calcium sulphate to balance the pH to 6.4. This also helps in the prevention of kidney stone formation since they only are able to form in an alkaline environment. EΒential taurine and other important vitamins and minerals round off this special diet nicely, providing your cat with everything it needs to stay healthy and active. Kattovit Urinary cat food at a glance: Special dry food for cats with diseases of the lower urinary tract (FLUTD) Perfect for the prevention of struvite stones Reduced magnesium content: prevents the formation of new struvite stones containing magnesium With DL-methionine and calcium sulphate: acidifying effect, reduces the pH level in cat urine With taurine: eΒential amino acid for a healthy heart and good vision With important vitamins and minerals: for a complete, well-balanced diet Trial Pack I contains: 1 x 1. 25kg Kattovit Urinary Chicken dry food 6 x 175g Kattovit Urinary Tuna wet food Trial Pack II contains: 1 x 1.25kg Kattovit Urinary Chicken dry food 6 x 175g Kattovit Urinary Veal wet food More information about the individual varieties can be found here: Kattovit Urinary Dry Cat Food Kattovit Urinary Wet Cat Food.